I was having one of those days where I woke up dazed and feeling hungover. You know the ones, right? My allergies have been bothering me in the form of itchiness that worsens as the day goes on. Even though I'm tired and sleepy at bedtime of course it was driving me crazy, so I got up and took Benadryl and then even later a half sleeping pill. This morning, I decided to go easy on myself. I walked to the coffee shop to meet some friends. By the time I got home and hung out the wash, it was lunch time. 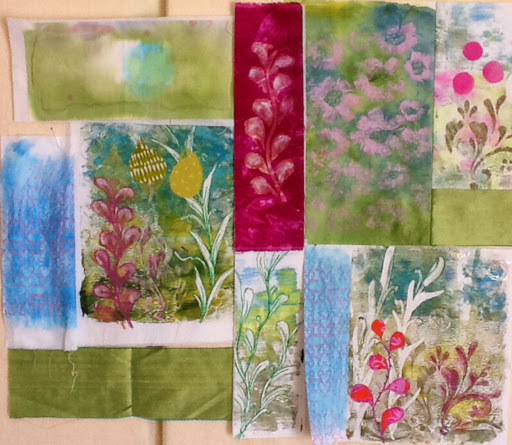 On the weekend I thought about doing some fabric painting and printing today, but changed my mind this afternoon. 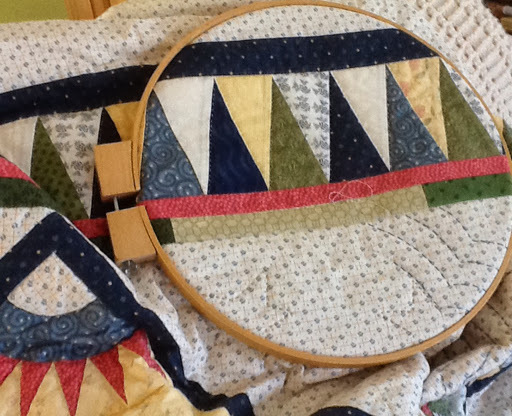 I went into my studio and thought I'd just do a bit of mindless traditional piecing. 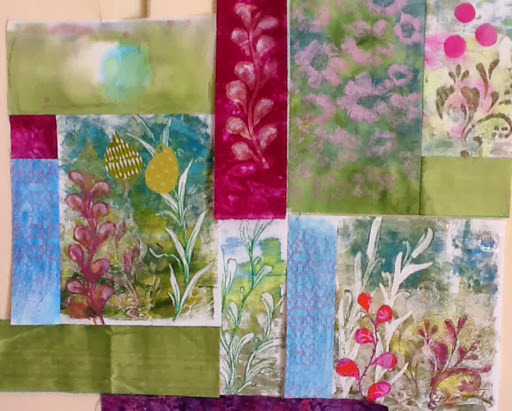 When I started clearing my cutting table a bit and I pulled out a few pieces of collaged and thread stitched Gelli prints that I had started last spring and threw them up onto my design wall. When I last played with them, I couldn't seem to settle on an arrangement, do I left them. I even used some for bags over the summer. I started stitching a few pieces together and rearranging. There will be more changes before it all goes together, but I think I'm getting it finally. I got totally absorbed in the process. That's what it's all about isn't it? Yesterday felt like a true fall day, sunny, slightly crisp and fresh. Today it is warmer and feels like summer. I got groceries done this morning while my husband did more of the foundation painting outside. He went golfing this afternoon, giving me some free time to sew. I did the rest of the machine stitching and quilting on my island art piece. It's going to take a few days to finish up the hand stitching, so in the meantime, I'm thinking about something new. 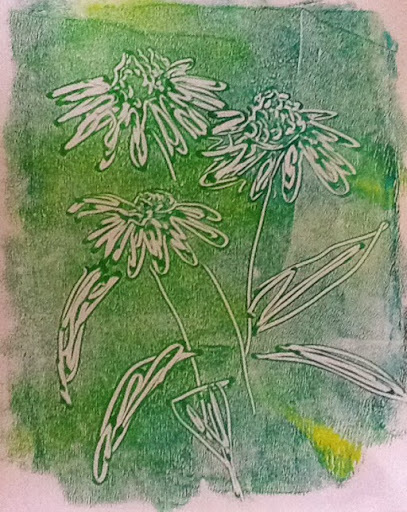 After a nice walk with a quilting friend, I had just a bit of time before supper and decided to try out a mono printing idea on paper. I brayered acrylic paint onto a piece of plexiglass and drew into it with a pencil eraser. Then I laid a piece of copy paper on top and rubbed with my hand. I used a stiff paint brush and the eraser on the second one. I think this would work well on fabric too. I like the graphic quality and additional machine and hand stitching would add to it. Yesterday, I took myself and my sewing machine in for service. 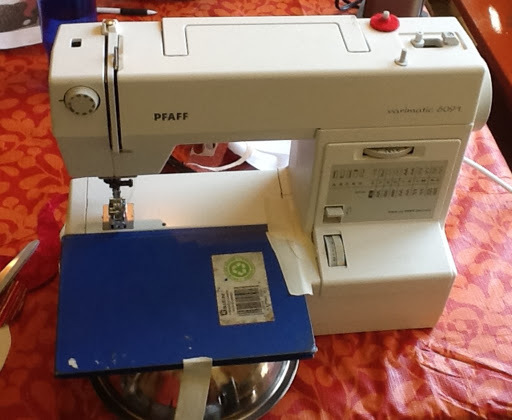 The sewing machine got a cleaning and an oiling and I will pick it up tomorrow. I wish it were so simple for me! I was told that my recent blood tests show a raise in my cholesterol. This was not good news to me as I'm already taking medications for thyroid, Addison's disease, high blood pressure, allergies and asthma! I'm on the watch and see plan for the moment. I admit to being 'naughty' with my diet in August/September with all my travelling. I didn't say no to desserts which I love but try to control when I'm home. My exercise was more sporadic than normal. Now, I have to get back on track. 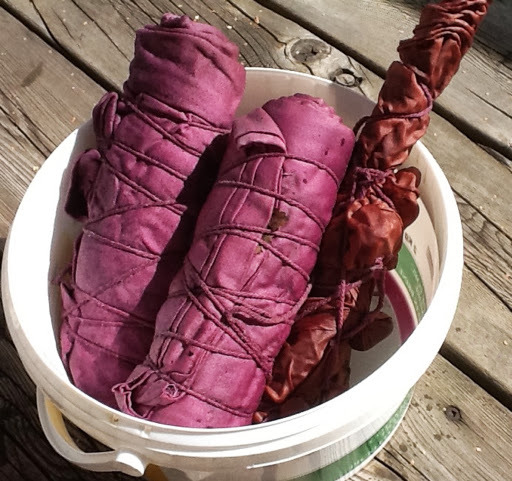 This morning, I put on a dye pot of Logwood and took some time to wrap some scarves and tie up some pebbles. Here you see the results of the 2 scarves, one piece of cotton and one piece of linen. I found a white linen blouse at the Salvation Army store yesterday. Although the tag was gone, I'm hoping it's 100% linen. If not it'll just finish up a little lighter. This afternoon, since I don't have my machine, I sat down with my island piece and started adding some hand stitched daisies and tansy. I'd like to have kept going, but boy even with all my little helper tools, my fingers were hurting me. I use a thimble for pushing and a rubber finger cot for pulling the needle. They really help; however, if I don't want the fingers to keep me awake tonight, I've got to give them a rest. Tomorrow is another errand day, and the sun is supposed to finally come out this weekend do I may not get to my sewing machine until next week. My bobbin has just run out and I'm taking it as a sign to stop for a break. I've listened the advice of a few people and pushed on with my island piece today. After making muffins this morning and sharing them over tea with a friend, I got started. I've now got the whole thing sandwiched with batting. I started in the sky to see how that was going to work out. I did manage to quilt out all the ripples in the water area but there are still some in the sky which I'm just going to have to accept. 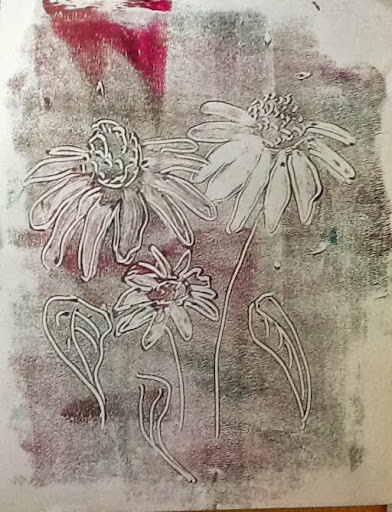 I started adding some white daisies and a bit of yellow flowers when the bobbin ran out. I just have a bit more to do before I add a few hand stitched ones to the foreground. Tomorrow is my day out-- a doctors appointment and then my few volunteer hours in the hand craft shop downtown. I'll have to wait until Thursday to get back to this piece. Wednesdays and Fridays are my days to have the car and I try to squeeze in errands and any appointments that might arise. Usually, I swim on Wednesday morning but tomorrow I'll see the doctor. Friday, it's a haircut. I have to get decent for my drivers license renewal! I'm linking as usual to the Needle and Thread Network. This morning, I did my usual household chores, getting them done as soon as I was done breakfast so I could forget about them and move on to fun stuff. I've never been a procrastinator. I met friends for coffee, getting a drive due to the rainy weather we're having today. I'm lucky to live close and usually walk over. In my bit of time left before lunch, I did a small clean up of my sewing space and cut a few 12 1/2" blocks of fabric for an upcoming sewing night we're having at our guild. We have pizza first and then we'll get down to sewing some stained glass blocks to be made into quilts for Victoria Quilts. This organization sends quilts upon request by friends or relatives to cancer patients. I've put borders on my island piece. I love the colors and everything about it except that it has some rippling as you can clearly see in the photo. My dilemma is, now, do I finish it and hope that quilting when I add the batting will even it out? Past experience tells me maybe but perhaps not since there are a lot. I have put a lot of time and thread into it so maybe I should carry on. In the meantime I've researched a bit about white cotton fabric as I'm quite convinced that a tighter weave would have less rippling. I did back it with a stiff interfacing, by the way. So, rather than make a decision today, I repaired a pair of pants that had been sitting most of the summer. 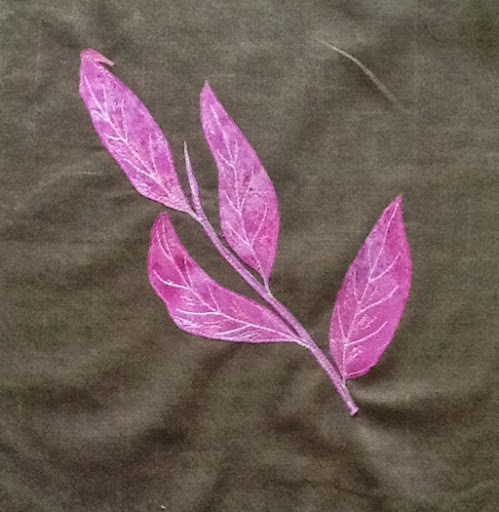 I also stitched on the leaves for my contribution block to our out going president. It's been a finishing up kind of day. 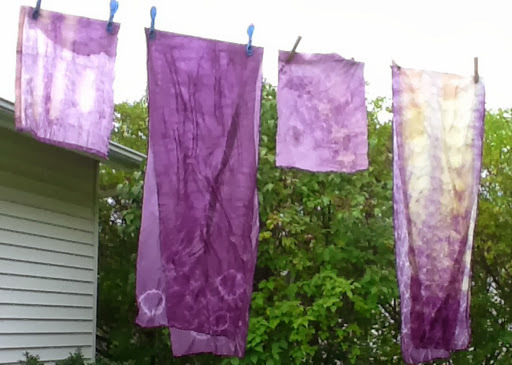 I finally washed my natural dyed pieces. No matter which room I photograph them in, the color comes out a little more brown than it is. The shade is actually kind of a mauve. 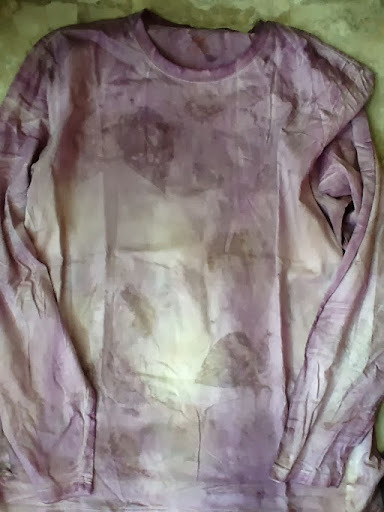 The leaves printed pretty well on the T-shirt. I can't wait to cozy into this for bed tonight! 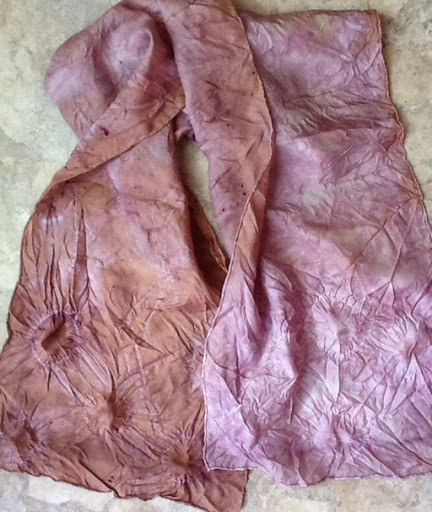 The scarves are quite pretty too, also a little more mauve than is showing. There are subtle rings on both ends that I achieved by tying up pebbles. I know it looks like I got lazy on the ironing. 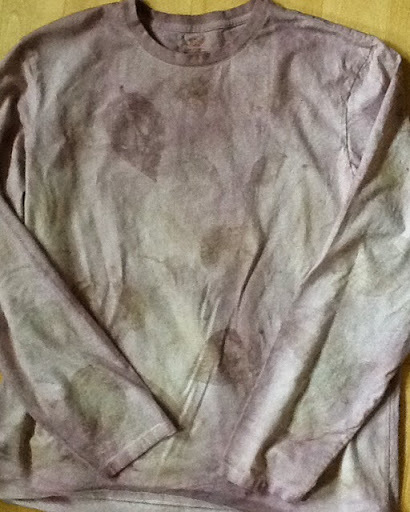 I may have to take them to the dry cleaners for pressing as I steamed the heck out of them, even damp from the wash and it clearly didn't do much! I think I'll be adding a bit of gold patterning with fabric paint before I call them done. I went to my first guild UFO day of the year today. 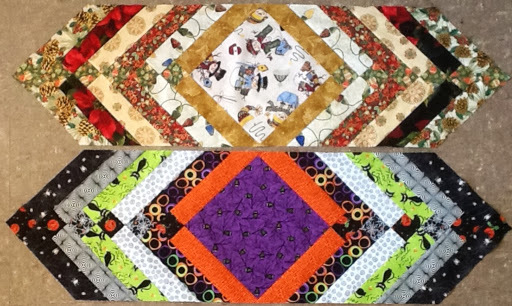 As some of you might know, I generally take traditional sewing or quilting to that and keep my art quilting for home. Last year, I got a quilt done. 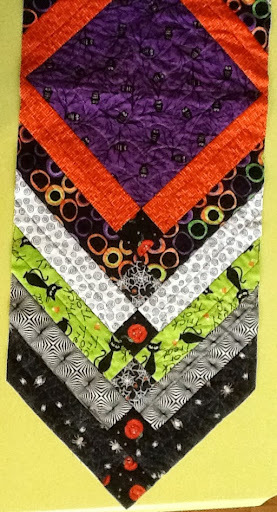 Today, I put the binding on my Halloween runner which I won't show again until I get it hand sewn down. Then,I finished this organizer that goes over a sofa or chair arm. It will be a Christmas gift. The last thing that I did, but again didn't take a picture of was to start string piecing some 2 1/2" inch scrappy squares together. I want to use them as a border for my postage stamp scrappy star quilt. I'm hoping to get this one finished at the next few UFO days and at the fall retreats. This is how it was in the spring. I have the black all the way around now. The next border will be the four patches. I will have a final border that matches the corner stone blocks. Tomorrow is supposed to be a rainy day, so I may get a little more stitching done on my latest art piece. I was out for most of the day today -- doctor's appointment, groceries and lunch. The rest of the afternoon before I went to pick up my husband from work, I was adding a new page to my blog. 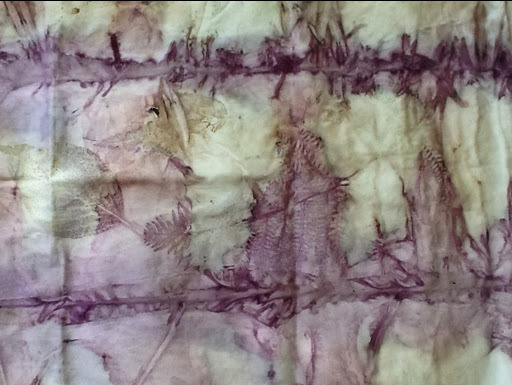 It's called Portfolio and has a bit of my fiber art in a slide show. I've figured it out at least, but will still be changing it as I don't like how it cuts off part of the photo; didn't realize that would happen. I've been having a pretty good summer for sales at our local waterfront shop although it has slowed down a bit as the tourist season slows. This is a piece that sold this week. I call it Old Firs. Also, I'd like to thank those who made a donation to my Run for the Cure to help raise money for breast cancer. I appreciate it. You still can donate! The run is on October 6th. You can email me your mailing address. It's a perfect sunny fall day today. The kind where it's warm but comfortable and one can do a few garden chores without working up too much of a sweat. I like to do my household chores and bits of garden clean up in the morning so I can get to my sewing after lunch. I've got most of my tomatoes in now, the beans are done, but there's still lots of Swiss chard and carrots. 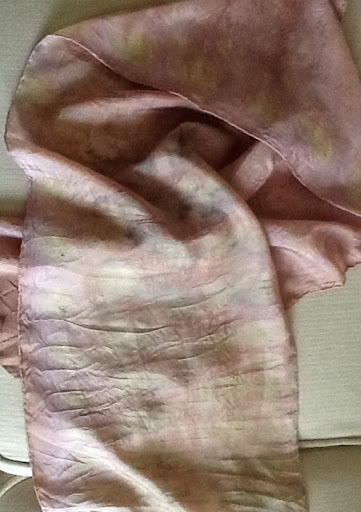 First of all, I want to show a couple of my natural dyed pieces. The first is a T-shirt that I will be wearing as a pyjama top. The color is a little deeper than it appears. I love how well some of the leaves printed! 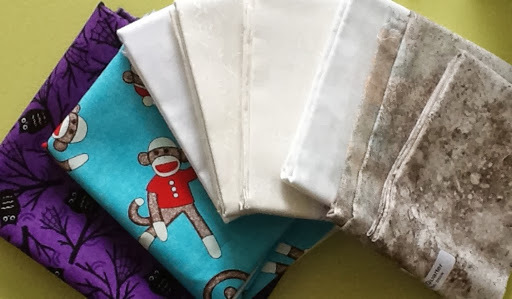 I did a pair of good quality percale pillowcases and I'm pretty pleased with them too. Look closely for the leaf patterns! I also did two silk scarves. I used some leaves on them too, but I also did a row of tied pebbles at each end which resulted in small subtle circles. My plan for the scarves is to add some additional paint designs to them to 'glam' them up a bit-- perhaps a little gold fabric paint. First though, the pieces need to be washed and I'm really hoping the color will hold. I spent another hour or so adding more thread painting to my island piece. It measures 8 1/2 by 10 1/2". I've added more to the background--water lines, reflections, sand, etc and I've added darks to the foreground. That's it for my shoulders today. I need a few more light grasses and pebbles in the front and then finally, yes, the flowers! I've got some rippling even though I used a heavy weight interfacing but I think when I add the borders and the batting and quilt it some, it will be OK. I'm seeing some amongst the grasses in the forefront as well. Finally, it occurred to me yesterday while going through my closet that I should haul out a quilt that I've had on the go for years! The mariners compass in the center was all hand pieced although the rest was machine pieced. A lot of the quilting is by hand. It's 3/4 done, so I've decided to work on it in the late afternoons when I stop my machine sewing to make tea and take a break before dinner. I'm almost out to the outside border. I've shown the whole quilt in the past and promise to show it again as I go along. Boy, I've had lots to say today! 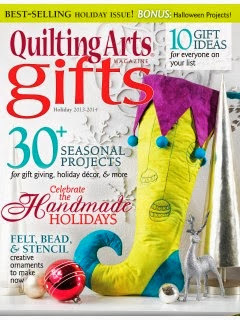 Just a reminder to check out my giveaway of a copy of Quilting Arts Gifts magazine on yesterday's post. I'll draw tomorrow night. I would also really appreciate even the smallest of donations to my run in support of breast cancer. In our local quilt guild, we've had a summer of terrible loss due to cancer as well as others who have been diagnosed.i decided I'd like to do something and after a bit of research, found the Run for the Cure which is actually in support of breast cancer. The timing was right though, plus it's on my birthday! I would appreciate a donation from anyone who feels they can by simply going to my personal donation page. Also, I thought I might do a bit of a giveaway to celebrate my latest article in Quilting Arts Gifts magazine. I'm going to give away a copy of the magazine to a lucky commenter if you leave a comment by Friday, September 20th. For a second chance if you make a small donation to my run, send me a second comment to let me know. Thanks! 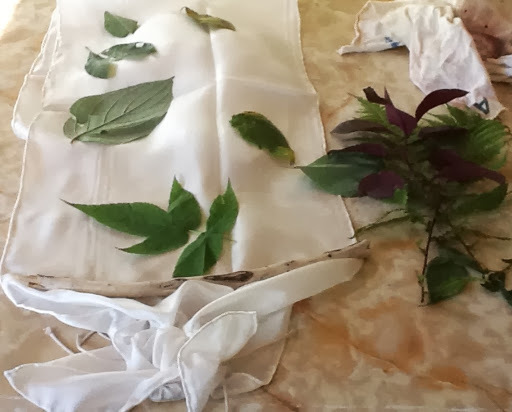 This is what I've been up to this morning-- gathering leaves and small pebbles and wrapping them in cotton pillowcases and silk scarves to go in the cochineal dye bath. They will simmer away today and hopefully, I'll unwrap them tomorrow. While the pot was simmering, I had my lunch and then worked away at a bit more stitching on my island piece. It's coming along but I can't wait to start adding some of the foreground flowers. I had to stop to rest my shoulders so I took my pieces out of the dye bath to cool on the deck. I can't wait to see how they turned out. I can already tell that the color is a little different on the silk scarf to the right because I added tannin which is suggested for cotton fabrics. It changes the color of the silk. I got all my necessary sewing cleared up on the weekend, so I could get into the fun stuff today. The first thing I did was to snip a jagged edge all along the grasses that are in the forefront. Once satisfied I ironed all the fusible backed pieces down. Then the fun part began with the free motion stitching. I've only just begun! Every time I get into one of these, I realize that I do not have near enough to a suitable range of shades in my threads. 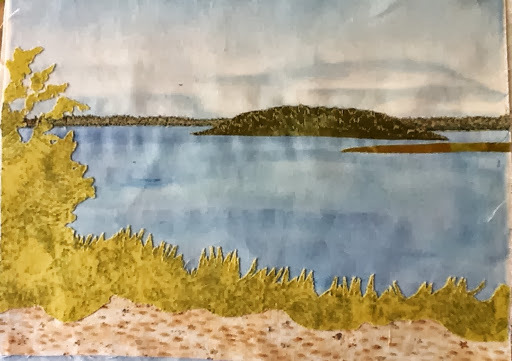 I've done the stitching on the sliver of land in the background and just started on the island. I've got to make do with the thread I've got because the only place to shop would be a couple of hours away. I'm making a list for my next trip. Another little project that I'm doing is a block for our out going president at our guild. At the end of their term they get to choose a block which each guild member may do. Elise chose a 9 1/2" to 12 1/2" block with any type of leaf or leaves on it. She provided the brown fabric. 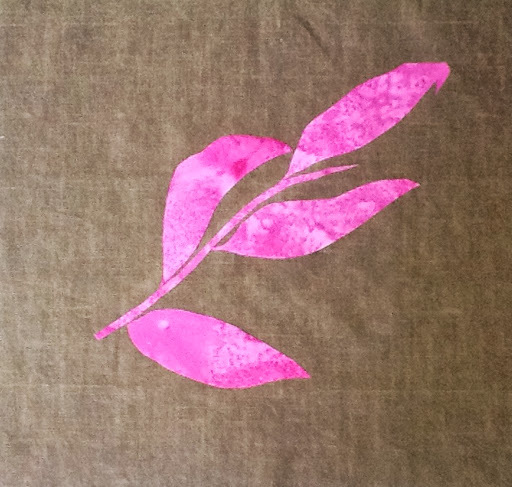 Of course, I would have chosen something much brighter, but I've gotten around that by using a bright pink for my leaves! I do have a photo that I took last fall that proves they really were this color! I will add the veins, shading and highlights with thread. 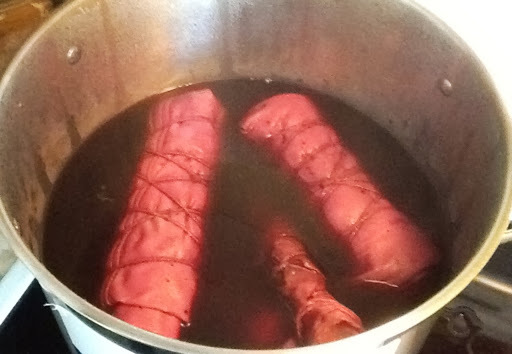 While I'm working on these two projects, I've also got some natural dye (cochineal) steeping and plan to get into adding some fabric to that tomorrow. For now, I'm taking a snack break before its time to start dinner -- breaded haddock filets and sliced roasted eggplant and tomatoes. It might be Friday the 13th, but so far, it's been a good day for me. I had an interview with a reporter from our local paper this morning. 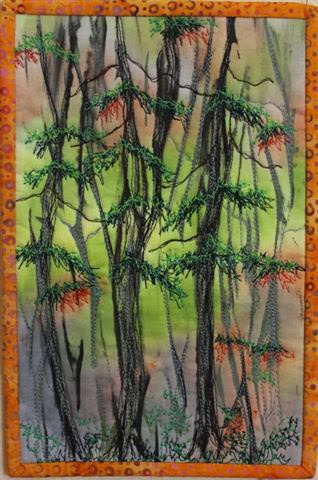 They're going to do a local interest article on my fiber art fame, (my Quilting Arts articles) ha, ha! 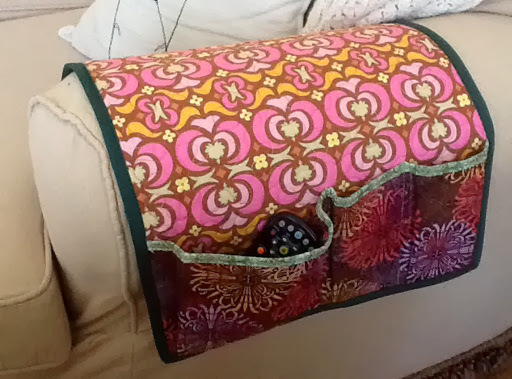 After lunch and errands, I finished up the bit of quilting on my runner. I'm picturing it now before the binding is put on because I've got to put it aside in order to get a couple of small priority sewing projects done. 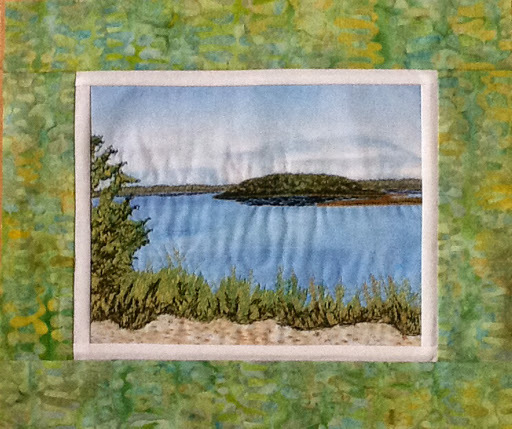 Next week, I hope to get back to my art quilting. I'll save the binding to do on one of my guild UFO days, perhaps. It is dark and rainy today so I had trouble getting a good clear picture. Here's a sideways view of one half. I sure love halloween colors! It would be great in many seasonal fabrics. Just about a half hour ago I arrived home from my 2 night retreat with my son's fiancé's mom. What a beautiful peaceful place it was, our little cabin on the lake. We were about an hour from home and had no TV, radio, phone or Internet. It was blissfully quiet. This was the view I looked at while sewing. 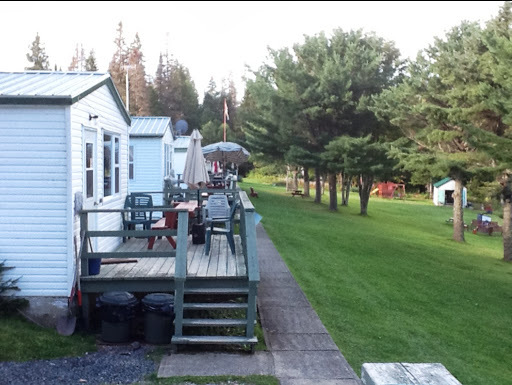 The cabins had a large living room/kitchen and two bedrooms with comfortable beds. I'm the supposedly an experienced quilter and Glenda is the beginner, but she brought more supplies than me! We had some good laughs over the things I forgot. Have a look at this next photo, tee hee! I forgot the little box that clips onto the front of my machine and had to jerry rig a platform so I could sew. It's not normally on my machine since my husband built the table to set in the machine flush so I completely forgot it when I packed up. Of course all my feet were in there too, but luckily Glenda also has a Pfaff so I borrowed. 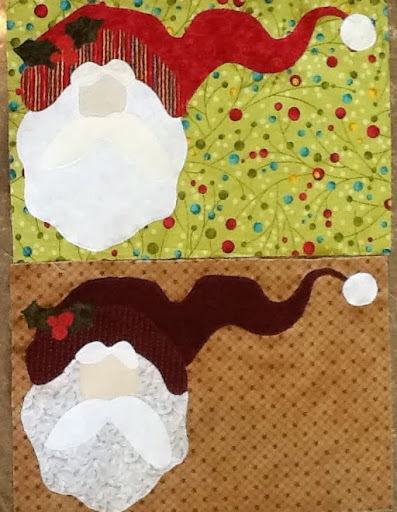 We planned to make 4 Xmas placemats each but neither one of us had enough fusible web. There was enough for us to do one each. Also, we had forgotten a natural muslin for the face, so we tea died a white piece. Luckily, we each brought fabrics to do a table runner but when I got out the directions, somehow I'd managed to bring only the first of two pages. We had the cutting directions but not the sewing directions. This normally wouldn't be a problem for me; however, this particular runner had a bit of a trick to it. Together we managed to figure it out. Luckily, we each brought fabrics to do a table runner, but when I got out the directions, somehow I'd managed to bring only the first of two pages. We had the cutting directions but not the sewing directions. This normally wouldn't be a problem for me; however, this particular runner had a bit of a trick to it. Together we managed to figure it out thank goodness! Can you guess which projects are mine? Despite all our (my) forgetfulness, we managed to get some projects done. We slept wonderfully and ate well with little prep as we cooked our dishes before we left. Wel'll be doing it again and maybe even 3 nights next time. I even squeezed in a little time on the front deck yesterday for a little watercolor sketch. Oh yippee, I just got an email that I won this weeks prize, a screen printing kit by Inksations, for my quilting story on Canadian Quilt Talk, It is in the Quilter's Corner at Canadian Quilt Talk which can be found on I Tunes. I'm connecting to the Needle and Thread Network today. There are lots of fiber related blogs to visit. This afternoon , I was supposed to go to the golf course with my husband but I wasn't feeling up to it. I guess I'm still recovering from all my travels. Also, I need to pack a bit for the 2 night quilt retreat I'm going on Monday and that was on my mind too. I rounded up my fabrics and supplies and then since I didn't feel like getting into any sewing, I decided to do a bit of scrapbooking/journaling with the few pictures that I had printed from my Lunenburg trip to visit my son. I have done some scrapbooking in the past but didn't get into it in a big way and now I don't have the time. I did, however, come across this little watercolor paper book that I made on our last trip to Lunenburg and thought maybe I'd add to it. It's nothing fancy, some pictures, a bit of paint and some journaling to help keep those special memories. As you can see in the small photo, my son is a surfer. We had a lovely day at the beach that day. We'd heard lots about how much fun he'd been having, but had never seen him surf. His wife has just started to learn as well. 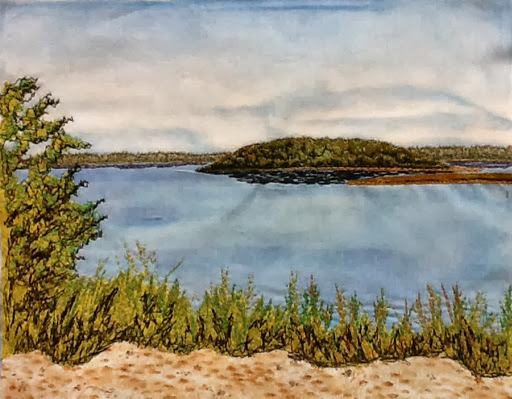 I've drawn with oil pastels and added some Inktense with salt and Saran for texture. Now, I'll have to let it dry. Tomorrow, I plan to make a spinach ricotta manicotti, one for retreat and one to leave for my husband. I'm leaving Monday after lunch, so will finish up a bit more food such as fresh fruits and veggies in the morning. I'll be away until Wednesday night. I'm back home but have no projects to show. Today was an unpacking, washing clothes and resting day. I spent 12 hours traveling on a train, shuttle, ferry and two flights yesterday, arriving home around 10:30 so I'm getting pretty tired at this point. I had a wonderful trip. 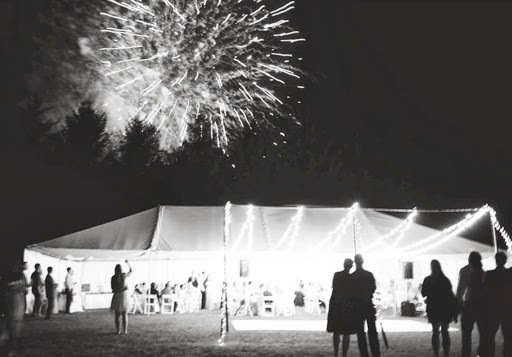 My niece's wedding which was held outdoors in the country was beautiful, as was she. 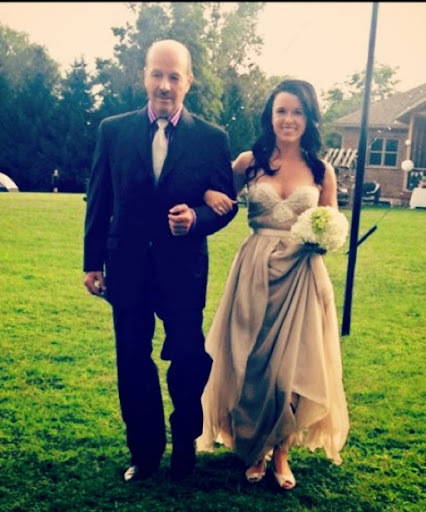 Here she is with her dad. Even though it looked like it might rain any minute, it held off until later in the night. I spent sometime with family in Oakville the next day and then made my way to London with my aunt where I stayed for a few days. My aunt Sandy is also a quilter so she not only took me shopping, but we also made the rounds of fabric stores and one very nice quilt shop called The Marsh Store Quilt Shop just north of London. The owner had a nice selection and variety of fabrics. I was very excited to say the least! Here is a sample of what I purchased. Of course, I had made sure when I packed for my trip that I left some space to bring home some fabric. 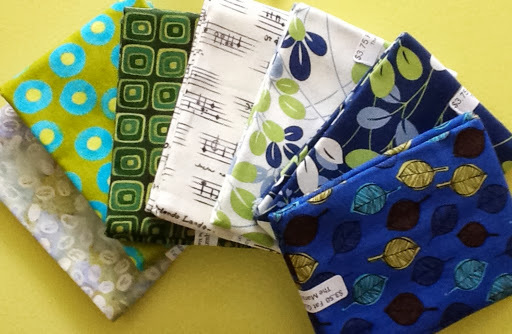 I don't normally buy collections, randomly choosing fabrics for certain projects or to add to my stash just because I like them. There were a few more but I've already got them in the wash. Also, I picked up a few specialty fabrics from Fabricland. Here's one final photo that I meant to add above. It's just so pretty I had to put it in. My I Pad App doesn't seem to let me insert photos where I want. They have to be added as I go. I won't have much to show again until later next week as I'll be busy on the weekend and monday I'm going up to a cabin for a couple of days with a friend. We are taking our quilting projects.